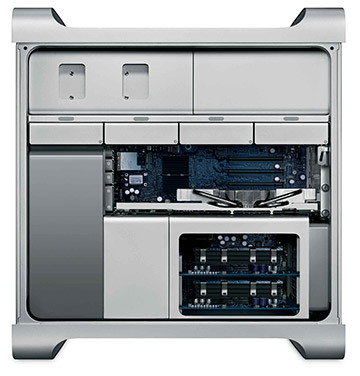 This BTO 'Build to Order' Mac Pro quad core 2.0 (Gen 1) gets it's heartbeat from two 2.0GHz dual core Intel Xeon 5130 processors with 4MB of shared level 2 cache per processor, a 128-bit SSE3 vector engine and 1.33GHz 64bit dual frontside buses.. The base factory configuration is 1.0GB DDR2-667 (PC2-5300) ECC "fully-buffered" FB-DIMM memory. The FBDIMM spec for these models includes large fully finned aluminum heat sinks to provide superior cooling. 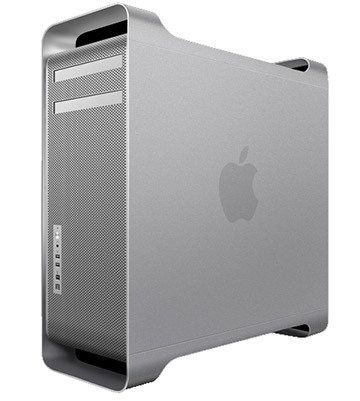 These models also came with a 7200 RPM 250GB 3GB/s SATA hard drive, a double-layer 16X "SuperDrive" plus an NVIDIA GeForce 7300 GT video card with 256MB of GDDR2 SDRAM, 1 dual-link DVI port and 1 single-link DVI port. Expansion is where these models shine with 8 memory slots, each accepting up to 4GB per slot, yielding 32GB possible maximum. It also has 2 Gigabit Ethernet, 5 USB 2.0 ports, 2 Firewire 400 ports, 2 Firewire 800 ports and optical digital audio in/out, Bluetooth 2.0+EDR, AirPort Extreme (802.11g/n) with a modem option.